Payment methods using NFC mobile technology and debit cards offered by Orbis Company will be the next step in reducing the flow of cash money from the market. Free wireless Points of Sales offered will help small traders, entrepreneurs, self-employed, small as well as big business owners, receive payment for their services and products. As we all know many of cryptocurrency projects and systems, like Bitcoin, Riple, Viacoin and many other, only offer virtual services. Orbis team intends to open physical branches all around the world that will have self-service ATM machines and one of a kind virtual reality customer service desks that will automatic provide monetary deposit, withdrawal, transfer , payment and investment services. Orbis team will provide professional marketing and investment services based on smart contract software helping startup companies evolve. Having a young, philanthropist vision, we will also help the society, bringing technology in places where people can’t afford and helping the ones that in need. Once you have registered, and participated in the ICO, you have entered in our ecosystem being able to manage your assets with only an internet connected smartphone or computer. Our utility Orbis coin (ORBS) will have a stable price and will be used by customers to make payments , save and transfer with no fee their assets without the risk of depreciating or loosing. 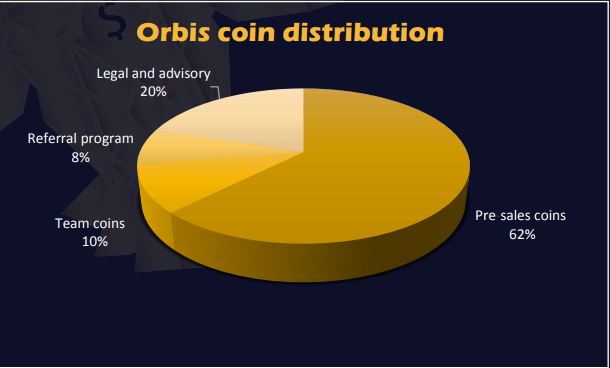 Orbis security coin (ORBSi) will be released public to cryptocurrency exchanges and traders. Users will be able to convert cryptocurrencies and fiat money into Orbis coins and manage them via Orbis card/smartphone apps/desktop software and in our future Orbis self-service branches worldwide.